Clashes broke out Friday afternoon between Israeli forces and young Palestinian men in the East Jerusalem neighborhoods of Wadi al-Juz and al-Tur as well as the towns of Abu Dis and al-Ezariya in Jerusalem district, a local spokesman said. 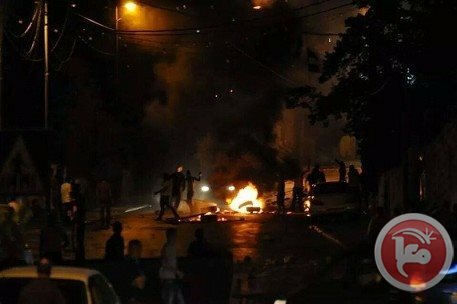 Hani Halabiya, a spokesman of resistance committees in Jerusalem district, told Ma'an that fierce clashes broke out in Abu Dis and al-Ezariya during which Israeli troops shortly detained five Palestinian youths. They were held in a police station in the Israeli settlement of Maale Addumim and in a military base known as al-Jabal (the mountain) for several hours before they were released. Rami Illariyya, a freelance journalist who was among the detainees, said more than 10 Israeli soldiers assaulted him and the other detainees. "They stopped me while I was doing my job in al-Ezariyya beating me and kicking me violently, then they assaulted me again while I was held at Maale Addumim police station," he explained. Clashes were also reported in al-Tur neighborhood on the Mount of Olives in East Jerusalem. Witnesses said Israeli troops showered houses in the area with tear gas which reached al-Maqasid hospital. The soldiers detained a young man near the hospital beating him violently. Fifteen more youths were forced to squat in the middle of the street at a junction about 100 meters from the hospital. In Wadi al-Juz neighborhood, Israeli special forces broke in firing tear gas and stun grenades in the narrow alleys. No detentions or assaults were reported there. Clashes broke out, Friday afternoon, between Israeli forces and young Palestinians in the East Jerusalem neighborhoods of Wadi al-Juz and al-Tur, as well as the towns of Abu Dis and al-Ezariya in Jerusalem district, a local spokesman said. Hani Halabiya, a spokesman of resistance committees in Jerusalem district, told Ma'an News Agency that fierce clashes broke out in Abu Dis and al-Ezariya, during which Israeli troops briefly detained five Palestinian youngsters. They were held in a police station in the Israeli settlement of Maale Addumim, and in a military base known as al-Jabal (the mountain) for several hours before they were released. Rami Illariyya, who is a freelance journalist, was among the detainees and said that more than 10 Israeli soldiers assaulted him and the other detainees. Clashes were also reported on the Mount of Olives, in the al-Tur neighborhood of occupied East Jerusalem. Witnesses said that Israeli troops filled the area with tear gas, reaching al-Maqasid hospital. Soldiers detained a young man near the hospital, beating him violently. Fifteen more youths were forced to squat in the middle of the street, at a junction about 100 meters from the hospital. Israeli special forces also broke in firing tear gas and stun grenades in the narrow alleys of the Wadi al-Juz neighborhood. No detentions or assaults were reported there. The Israeli occupation authorities (IOA) Thursday brought the al-Aqsa satellite channel news reporter Alaa al-Titi before the Ofer military court on charges of working for a banned satellite TV station. The family of the news reporter told the Palestinian Information Center (PIC) that its son was indicted for working for a banned channel, adding that the court extended his detention until next Monday. The Israeli occupation forces last Wednesday (IOF) kidnapped Alaa al-Titi from his home in the Arroub refugee camp, north of the southern West Bank city of al-Khalil. Titi is an ex-prisoner, who has spent over four years in Israeli jails and a few months in West Bank detention centers. 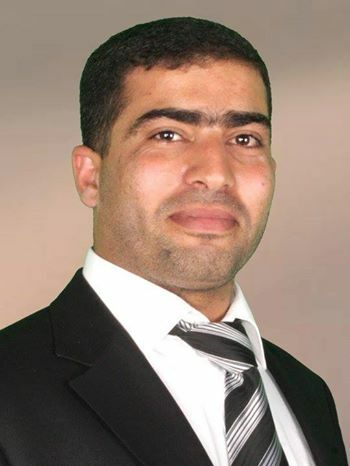 The Israeli Occupation Forces (IOF) arrested at dawn Wednesday the journalist Alaa Jaber Titi, 33, after violently breaking into his home in Aroub refugee camp to the north of al-Khalil. Family sources told a PIC reporter that more than one hundred Israeli soldiers surrounded Titi’s home and violently broke into his apartment. 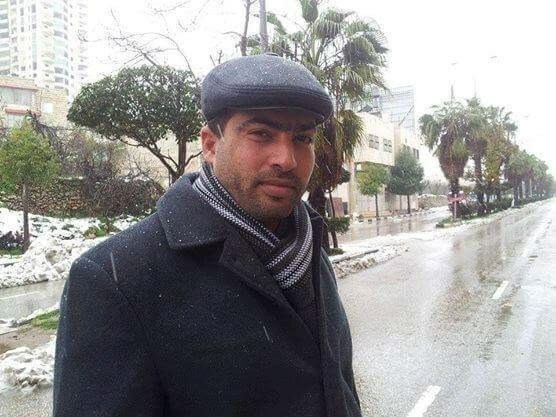 The IOF arrested Titi, a reporter at al-Aqsa TV Channel, after carrying out searches in his house. Titi’s arrest came only a week after his release from PA jails where he was detained for several times by PA security forces, in addition to spending four years behind Israeli bars. 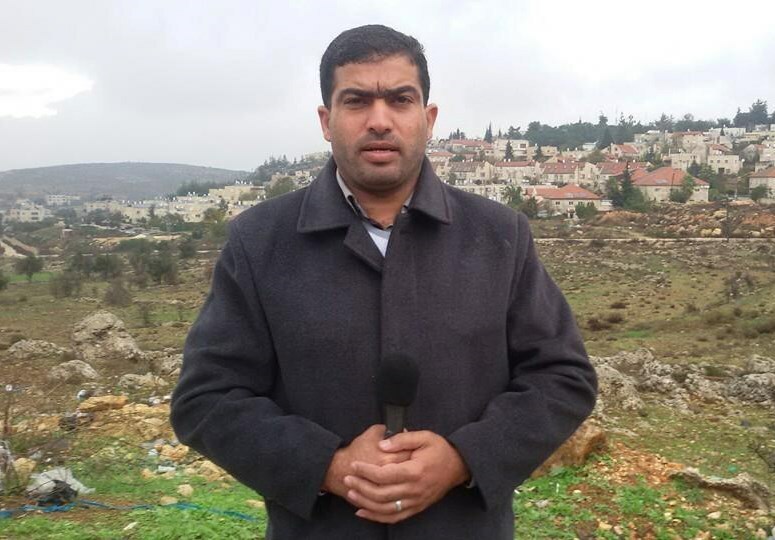 Titi’s detention is considered the second arrest targeting journalists in two days after the journalist Mujahd Bani Mefleh was nabbed by Israeli forces on Monday from his home in Ramallah. Palestine Center for Prisoners’ Studies pointed out in a statement issued Tuesday that 16 Palestinian journalists are currently held in Israeli prisons. Journalists’ detention fell as part of Israel’s policy to cover up its crimes and violations against Palestinian people, the statement charged. The human rights center stated that Israeli deliberate targeting of journalists will never succeed in hiding the truth or beautifying Israel’s image, calling on international media institutions and journalists’ syndicates to exercise pressures for the Palestinian detained journalists’ release. For its part, Quds Press called on the Israeli authorities to immediately release its reporter Mohamed Muna and all the journalists illegally held in its jails. Along the same line, Palestinian media forum strongly condemned Israel’s fierce arrest campaign against journalists; most recently was the detention of Titi and Mefleh. The Forum said that following the two journalists’ arrest in the West Bank, the number of journalists held in Israeli prisons increased to reach 17. The media forum also denounced the pregnant journalist Juman Abu Arafa’s detention on Monday while leaving al-Aqsa Mosque before being released and prevented from having access to the holy shrine for 15 days. The forum warned against Israeli tight restrictions imposed on journalists working to reveal settlers’ crimes and Judaization policy in occupied Jerusalem. "We call on International Federation of Journalists and Reporters Without Borders to bear their responsibilities and break their silence towards Israeli escalated violations against journalists in occupied territories, and to work for their release", the forum’s statement concluded. 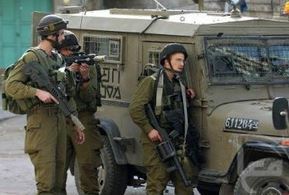 Israeli soldiers invaded, on Wednesday at dawn, several Palestinian communities in the northern West Bank district of Nablus, and the southern West Bank district of Hebron, and kidnapped 18 Palestinians. Many residents injured near Jenin. The Palestinian News & Info Agency (WAFA) has reported that dozens of military vehicles invaded the Balata and ‘Askar Al-Jadeed refugee camps, in Nablus, and kidnapped twelve Palestinians. WAFA said the soldiers ransacked dozens of homes in the two refugee camps while searching them, interrogated families, and detonated the main door of one of the raided homes, belonging to former political prisoner, Bashir Hashash. It added that some of the invaded homes belong to Palestinian security and police officers. The kidnapped in Balata have been identified as Ayman Kharma, Mohammad Tirawi, Mohammad Saqer, Shaher an-Najma, Mahmoud Abu ‘Ayyash, Mohammad Ali Hashash, and ‘Ammar Mit’eb, Abdul-SalamAbu Rezeq. In ‘Askar, the soldiers kidnapped Kamal Abu Seryya, Hasan al-Ashqar, Sameh Abu Keshek, and Mojahed Mashayekh. In addition, soldiers invaded Doura and Beit Ummar town, and the al-‘Arroub refugee camp, in Hebron, and kidnapped six Palestinians after breaking into their homes and violently searching them. Local sources in Doura said the soldiers invaded the at-Tabaqa area, and kidnapped five Palestinians identified as Abdullah Harbeyyat, 15, Mahmoud Hakam Harbeyyat, 17, Mos’ab Mahmoud Etbeish, 18, Dia’ Mohammad Hantash, 19, and Taleb Mohammad Faqqousa, 40 years of age. The Popular Committee against the Wall and Settlements in Beit Ummar said the soldiers also kidnapped Qssam Ahmad Abu Hashem, 21, after searching and ransacking his home. His father is a political prisoner, currently held by Israel under arbitrary Administrative Detention orders, without charges or trial. In addition, soldiers kidnapped a Palestinian journalist, identified as ‘Ala at-Teety, who works for the al-Aqsa Satellite TV station and news agency. On Tuesday at night, several Israeli military vehicles invaded Deir Abu Da’if village, east of Jenin, and clashed with dozens of local youths. Medical sources said many Palestinians suffered the effects of tear gas inhalation. Eyewitnesses said the clashes took place after the soldiers invaded many homes, and interrogated family members, while ransacking their properties. A female reporter from Gaza City sustained bruises after she was attacked by an unknown man with a baton inside a busy building housing several medical centers and private clinics. 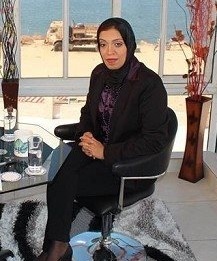 Maha Abu Oweimir, who works for the Saudi Riyadh newspaper, told Ma’an that she was in the Dr. Al-Agha building to receive results of lab tests when she was repeatedly hit with a baton until she fell to the ground. Abu Oweimir added that at the beginning she thought the attacker was a thief but she realized later that he wasn't because he didn't take anything after she fell. "It never crossed my mind that the young man was going after me simply because the building is full of medical centers and clients. He was walking behind me and I was about to go downstairs when I saw his shadow raising a baton behind me about to hit me on the head. The fact that I saw his shadow helped me avoid a direct bang and I turned backward so the baton lightly hit the right side of my head." The reporter added that she fell to the ground and the assailant continued to attack her despite the fact that she asked him to take her hand bag. "I told him to take the bag, but he just asked me to keep silent and not to shout," she added, explaining that at that point she realized the motive behind the attack wasn't theft. Abu Oweimir said she was going to file a complaint at the DA's office. The Israeli Occupation Authorities (IOA) released late Monday the Jerusalemite journalist Juman Abu Arafa after being nabbed afternoon while leaving al-Aqsa Mosque. Juman was denied access to al-Aqsa Mosque for 15 days on charges of shouting Takbeer and protesting against settlers’ breaking-ins into the holy shrine. Any Israeli settler breaks into al-Aqsa Mosque is an intruder, she stressed. Earlier Monday, Israeli policemen took Juman to Qishla police station in the Old City of occupied Jerusalem, eyewitnesses said, adding that Jumana is pregnant. Israeli policemen arrested the Jerusalemite journalist Joman Abu Arafa on leaving the Aqsa Mosque via the Asbat Gate on Monday. Eyewitnesses said that the Israeli policemen took Joman to Qishla police station in the Old City of occupied Jerusalem, adding that Joman is pregnant. Israeli soldiers kidnapped, on Monday at dawn, a journalist near the central West Bank city of Ramallah, and two brothers in Bethlehem. Soldiers also invaded Hebron, attacked and injured one Palestinian. Media sources in Ramallah said several Israeli military vehicles invaded Betunia town, west of the city, and kidnapped a Palestinian journalist, identified as Mojahed Bani Mifleh from his home. The Palestinian Journalists Syndicate issued a press release denouncing the arrest, and said the kidnapped journalist works as a news editor for the Social Media Office of the al-Quds University's Media Center. It called on various legal and human rights groups, locally and internationally, to expose the ongoing Israeli violations, and pressure Tel Aviv into releasing all detained reporters. 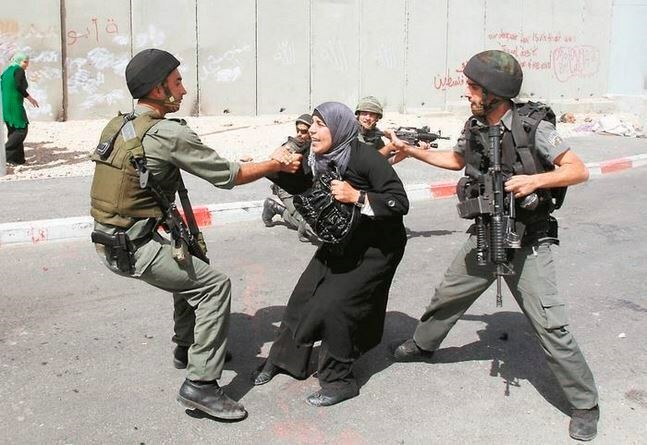 The Syndicate said the army continuously targets journalists and media outlets in occupied Palestine as they expose the ongoing Israeli violations against the Palestinian people. In addition, soldiers invaded the al-Khader town, south of Bethlehem, and kidnapped two brothers after breaking into their homes and ransacking them. The two have been identified as Walid Khader Salah, 27, and his brother, Wael, 24 years of age. In related news, soldiers chased a young Palestinian man in Hebron city, in the southern part of the occupied West Bank. 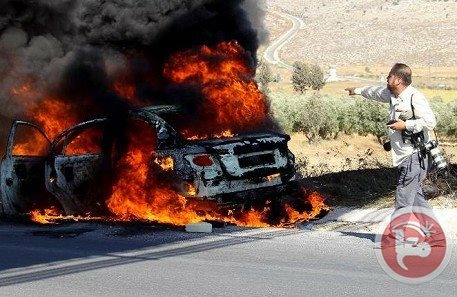 Local sources said the Palestinian, 21 years of age, was crossing the Shallala Road, in the center of Hebron, when the soldiers started shouting and screaming at him while cocking their guns. The soldiers tried to hit hm with the rifles, but he managed to escape, and was moved to the Hebron Governmental Hospital suffering a severe trauma and shock. Soldiers also handed resident Ahmad Othaman Karama, also from Hebron, a military warrant for interrogation in the Etzion military and security base. Last year was the deadliest ever for journalists working in the Palestinian territories, a Gaza-based watchdog said Thursday, months after a bloody war in the besieged enclave. "2014 was a black year for freedom of the press in Palestine... and it was the worst and bloodiest," the Gaza Center for Press Freedom said in its annual report. The report accused Israel of committing 295 separate "violations of press freedom" across the occupied Palestinian territories. These resulted in the deaths of 17 journalists during the 50-day Gaza war in July-August, including that of an Italian photographer working for Associated Press. Israel also arrested or detained an unspecified number of journalists, denied freedom of movement to local media workers wanting to leave the blockaded Gaza Strip, and partially or completely destroyed 19 buildings housing editorial operations during its bombardment of the territory during the conflict. Palestinian authorities also committed 82 violations of press freedom, including arresting or summoning 28 journalists, and injuring or assaulting 26 more. The conflict between Israel and Hamas in densely-populated Gaza, home to 1.8 million people, killed nearly 2,200 Palestinians, mostly civilians, and 73 on the Israeli side, mostly soldiers. The International Federation for Human Rights and Development condemned PA forces’ brutal attack against the journalist and political activist Muath Omla in Nablus. The Rome-based Federation pointed out in a statement issued Wednesday that two PA security personnel dressed in civilian clothes brutally attacked and severely beat up in late December the journalist Muath Omla due to his online criticism of the Qublan municipality performance. "I was threatened twice after I expressed my views over the local Municipal Council’s performance in Qublan village", the statement quoted the journalist as saying. The two security personnel were accompanied with the mayor’s son and one of his relatives, he added. Muath suffered head injuries and several bruises all over his body and face. While in hospital, he was also threatened by the mayor’s relatives to waive the complaint he made against the attackers. The International Federation warned of the serious violations made against freedom of speech and public freedoms in the West Bank. The Federation has documented since the beginning of December dozens of illegal arrests and summonses against journalists in the West Bank. The statements called for maintaining the citizens’ right to express their opinions by all means guaranteed by law. Representative of the Federation in the Middle East Joseph al-Sayegh said that the attack contradicts with the PA commitment to the international human rights law, and violates freedom of expression. 308 Israeli human rights violations against journalists were reported during 2014 in Palestinian lands, the Palestinian Media Forum said. In its new report, the forum said that 17 journalists including an Italian were killed during Israel’s summer aggression on Gaza and 58 others were injured while covering events in occupied Palestinian territories. The report documented the arrest of 25 journalists and the detention of 53 others while practicing their journalistic work. 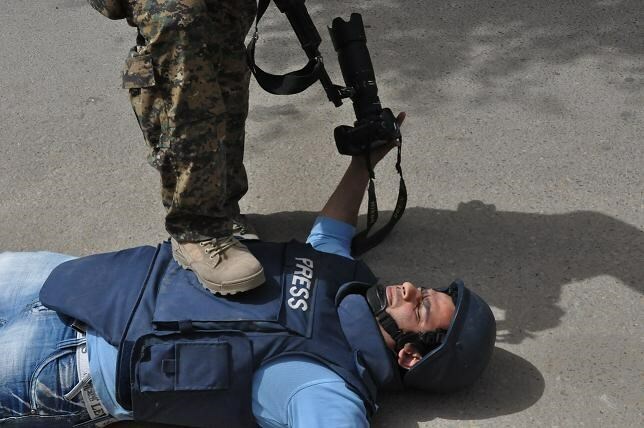 42 other journalists were prevented during 2014 from covering the events in Palestine. The figures showed that nine journalists were subjected to threats while 23 others were brutally attacked. 23 journalists were prevented from leaving the country. 32 homes belonging to journalists were totally or partially destroyed during the Israeli offensive on Gaza, according to the report. The report documented 21 cases in which Israeli forces shelled or destroyed media institutions during the latest aggression while 13 others were stormed. 54% of the reported violations took place in the West Bank while 33% were documented in Gaza Strip and 13% in occupied Jerusalem. 77% of 2014 violations were carried out by Israeli forces and police in complicity with Jewish settlers. On the other hand, the report said that PA forces committed 17% of those violations while 2% of the violations were carried out by Gaza government.